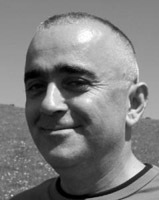 He was born in Ordu (Turkey) in 1964. He graduated in Fine Arts in 1987. He is an art teacher and cartoonist. His first cartoon appeared in the Çarşaf Turkey national magazine in 1984. Since then his cartoons have been published in national and international press. His first exhibition was held in Samsun in 1986. He has got 5 national and 2 international prizes. He’s married and has one child.